Moving Boxes and Catching My Breath ! What can I say – my brain comes and goes and recently it’s been away doing other things than this blog. I moved about six months ago and I’m just now catching my breath. Only a three-hour, 6-lane super-highway driving experience away, and an almost never-ending hassle. It wasn’t only getting into the new place ~ it was getting out of the old one. Let’s get the boxes off my chest first ~ I bought some boxes; I begged, borrowed, and pilfered others. The boxes I purchased I treated like gold ~ only using them to pack my books. Yes, they were the small book-boxes, and yes, I had help. But sooner or later, I wound up by myself moving each box from one side of the room to the other, then stacking them higher, then lower, then finally into a corner on the other side of the room. Never once going back over where they had been. I don’t remember what game my brain was playing, but my body was playing ~ Heart-Attack Attack ! I begged for those copy-paper boxes from work but found out the hard way, the only thing holding the cardboard together was the industrial strength plastic strapping bands around the outside. I remember breaking at least one pair of shears cutting through that tensioned, rigid, super-reinforced, stand-back-snap-right-at-you plastic stuff. Geeze, never again. I borrowed boxes from friends and family who offered them when they heard I was moving. Well, borrowed is a misnomer ~ very few used boxed were viable. Some didn’t even make it into my car. If the box moved with me, I didn’t make a return trip to give it back. No one called me asking for them either. I think it’s a sub-conscious no-guilt plot to foist off hand-me-downs. Pilfering boxes got to be fun ~ behind liquor stores particularly. I’d rifle through stacks of flattened boxes, probably on their way to somewhere, but winding up in my car. 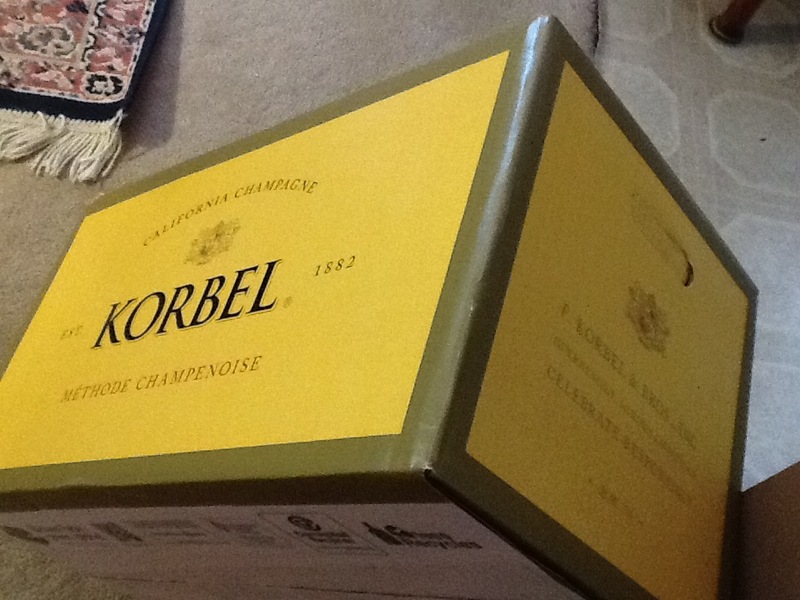 On a day I was seen, the clerk recommended I wait a moment, and then came back with the best booze box yet, in more ways than one ~ Korbel Champagne !